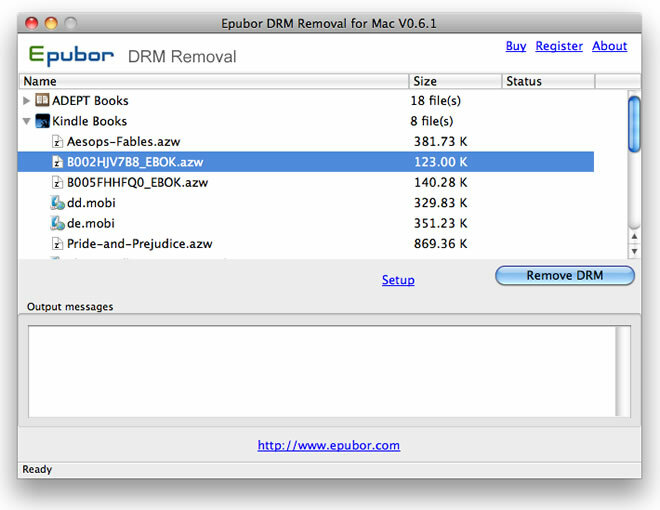 pubor eBook All DRM Removal for Mac is a powerful DRM tool enables you remove all drm from your eBooks, you can remove epub drm, pdf drm, adobe drm, Kobo drm, nook drm and kindle drm with one click. The DRM Removal tool will save the original eBooks on your computer, and made a new eBook without drm protections, so you can read the DRM free eBook on any e-readers without limitation. It integrate EPUB DRM removal, Kindle DRM removal, pdf drm removal, adobe drm removal, AZW and AZW3 DRM removal, Kobo drm removal, Nook drm removal into one software, it helps you read eBooks everywhere with any device. And also, you can buy eBooks from any online eBook stores, and still read them in one eReader. 1. Remove all eBooks' DRM protection from Kindle, EPUB, PDF, adobe, AZW, MOBI, PDB, AZW3, PRC, Topaz, etc. So you can easily transfer your books to be read on any e-readers, back up your eBooks, share your books with your family and friends, or even convert or edit your books easily. 2. Batch stripping function, save your time. It means you can add more than one DRMed files into the program at one time, then decrypt as many different DRMed files as you want in one activity. 3. High quality , no contents and layout losing. This awesome tool can help you get all the original contents and layout. 4. Easy to use. Only two steps, first drag the drm ebooks to main interface, then click 'Remove DRM' button, just need a few seconds you will get the high quality books without DRM protection. 5) Bunch of bugs fixed and performance improvements. Bug fixed: After decryption finishing, right click on the file name and choose "Explore the output file" can't open the file.